No, different areas, regions and countries all have their own sign language. For example, in Russia, Russian Sign Language is used. It has its own signs, own grammar and own finger spelling. What sign language is used in Cameroon? Cameroon Sign Language. (CamSL)The sign langauge that has developed in Cameroon is a mixture of local sign and the adapted/ adopted sign language first brought and taught by Christian missionaries and educators. In English speaking areas and a majority the French speaking zones, American Sign Language and has been used, taught and mixed with local sign. In some areas (primarily in the French speaking zones) French Sign Language is used and taught (and mixed with local sign as well. In the far North of Cameroon there is rural version of sign that is sometimes referred to as Extreme North Cameroon Sign Language. It is used around the town of Maroua. If I know ASL can i communicate with the deaf in Cameroon? In most areas, yes. (Some areas use French Sign Langauge). There are more similarities in ASL and CAMSL than there are differences. With patience and a teachable attitude visitors who speak ASL find themselves able to communicate freely with the deaf in Cameroon. 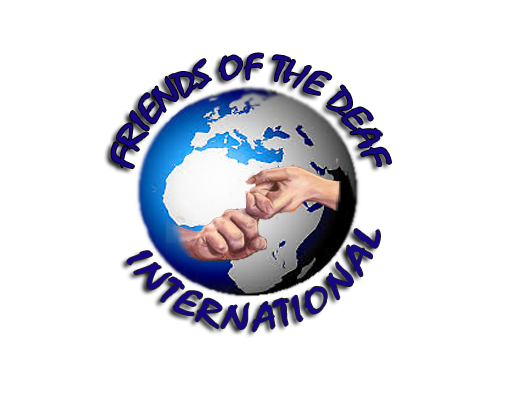 Friends of the Deaf is a non-profit, inter-denominational mission society of the United Anglican Church Province II. All gifts are tax deductible as allowed by law.